"Do you believe it" and "Mike Brown" may forever live together in the memory of Bear fans that followed the team during Brown's short nine-year tenure with the Chicago Bears. He was not resigned by the Bears following the 2008 season, after a career in which Brown scored more defensive touchdowns (7) than any other Bear in history. Brown was drafted in the second round of the 2000 draft over several other better-know safeties, after he wowed Bears scouts with his grasp of the game in the film room. The Bears had just signed free agent safety Shaun Wooden to start next to strong safety Tony Parrish, but Brown started every game of his rookie season. Early in that season Brown returned his first interception for a touchdown against the New Orleans Saints, and played solidly along fellow rookie Brian Urlacher. In 2001 Brown dominated, returning interceptions for touchdowns in back-to-back overtime, come-from-behind games. 2003 would be Brown's last fully healthy season, before which he signed a new six-year contract with the Bears. Injuries would limit Brown to just 21 games between 2004 and 2007. He rebounded with a solid 2008, but was again placed on injured reserve before the final game of the season. 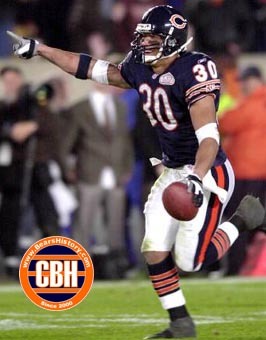 Brown was viewed by some as too small and too slow by some prognosticators prior to being drafted, but his play earned him a place in the BearsHistory.com Chicago Bears Ring of Honor.